Burns & McBride’s acclaimed Smart, Safe Home system combined with the electronic lock know-how of Kwikset offers customers a hard to beat package of services combining the best of residential technology and security. Burns & McBride is a leader in providing affordable home automation and security to Delaware Valley homeowners. Now they’ve improved the product even more by adding Kwikset’s leading edge Smart Code Signature series lock with wireless Home Connect technology to its home automation offerings. Through this partnership homeowners can monitor their door from any web-enabled mobil device or internet connection, even if they’re on a business trip or vacation 5,000 miles from home. Additionally, teamed with Burns & McBride Smart, Safe Home system, Kwikset’s Home Connect enabled locks can wirelessly communicate with other “smart devices” in the home such as lights, thermostats, smoke detectors or the burglar alarm. My mother in law stays with our family. If we aren’t home when she arrives, we use the Burns & McBride mobil phone app to turn the lights on, turn the alarm off and unlock the doors. The convenience and simplicity of the technology is amazing. 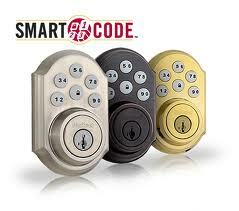 The SmartCode lock with Home Connect features a unique, patented technology with the first one-touch locking motorized deadbolt on the market. Burns & McBride’s Smart, Safe Home system connects the door locks with other security, convenience and energy management features through Z-Wave wireless technology.